I designed these "Standards for Mathematical Practice" posters to match 3rd grade Common Core State Standards. They will save you time as they make student learning easier and more fun. I'm making these free for 1 day because I really want to know what you think! Please rate these and leave feedback on the site! You can also e-mail me personally with any detailed thoughts at missjenny@edutunes.com...I'm happy to modify these to make them 100% amazing to you and your students! 1. Detailed, full-color versions. These contain explanations of what to do before, during, and after attempting a problem. They also include 3rd grade-level examples to show students exactly how they can use the standards in grade-level problems. 2. Simplified full-color versions, appropriate to hang on the wall. These remind students of their basic goals when solving math problems. 3. Detailed black-and-white versions. 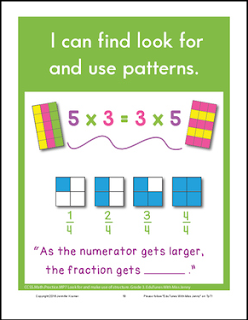 These are great for including in students’ notebooks, so that they can always refer back to them while solving problems. 4. Simplified black-and-white versions. You may choose to use these at the beginning of the year before expanding on them. I rephrased some "I can" statements to make the standards more comprehensible to 3rd graders. I also reordered them based on developmental research and how students generally solve problems. I included "persevering" first (MP1). Next, students usually consider using tools (MP5), followed by drawing diagrams (MP4), followed by using numbers and symbols to solve problems (MP2). Students follow the rest in order as they learn to explain their thinking, attend to precision, and look for patterns as well as regularity in repeated reasoning. Thanks so much for taking the time to consider my materials!